Thunder Reels is inspired by the vintage arcade games all over seaside establishments and casinos in the 1980s. This is a 3 reel 5 payline online UK bingo slot from Playson where players need to spin matching combinations of BARs and fruit to win. It’s a pretty basic game in terms of design, theme and rewards. It’s not all dull though, the game’s got a few special features that will cut the monotony. You’ll find out all about it below. Stakes start at 5p to £25 per spin. Playson is a Malta based team of designers who have successfully created more than 30 HD slot machine games so far. Their games usually take to the adventure theme. The company was formed in 2012, which means they’re fairly new in the industry and still have a long way to go. However, they’re quickly expanding and soon will compete in the same ranks as the industry’s big players. They have over 250 employees across the world and have established connections with several businesses such as Bet Construct, Leander Gaming, Quickfire and 1X2 Gaming. Experience Playson slots on Barbados with bingo promos for more chances of winning exciting rewards. Thunder Reels slot is for players who crave a little simplicity in a world full of over-the-top slot themes and gameplay features. Here you won’t have to worry about mastering how bonus features work, superior 3D animations, free spins or photo realistic graphics. All you have is a variety of symbols that will be familiar to slot fans of whatever age. The game’s visuals are standard –keeping in theme with the old-school flavor served. The dark blue backdrop creates an ominous vibe, but the gameplay doesn’t match that at all. Forks of lightning appear on either side of the reels. 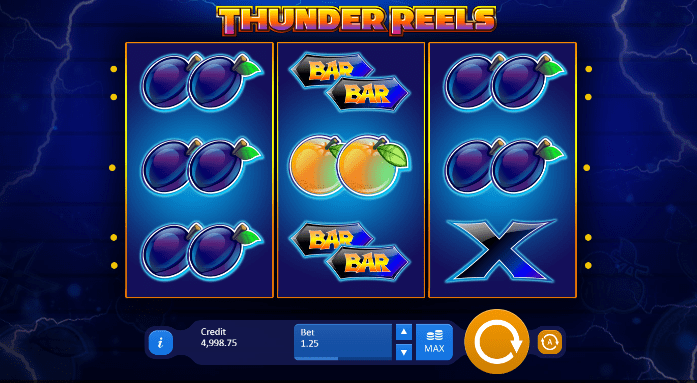 Thunder Reels is very easy to play, but has a high variance. Symbols include cherries, oranges, bars, berries and lemons, stars and lucky 77s. The lucky 77 is the highest paying symbol and offers payouts as high as 750 coins when you land 3 of them. The stars pay out 200 coins, the bars give 60 and the fruits pay 40. The X symbol has the lowest payout of 5. Winning combinations can be formed diagonally or horizontally. • Gamble feature- The standard gamble feature gives players a chance to double or quadruple their win amount by guessing the correct colour and suit drawn from a deck. For players who manage to fill all 9 reels with matching symbols, a 2x multiplier for your win amount awaits. A 4x multiplier awaits if you correctly guess a card’s suit. In this round, players are allowed 10 guesses instead of the standard 5. It’s quite surprising that Thunder Reels is a very simple game, but has a high variance, tendency for players to learn more before playing. One can expect a lot of long dry spells during play. When your luck does turn and the symbols start hitting, the rewards can be impressive. The game is quite fast paced especially during autoplay, so you need to be careful otherwise you’ll end up losing most of your cash. The developers have done a good job at replicating the classic traditional fruit machine look and feel. This will definitely appeal to you if you miss the golden arcade days. Barbados - Immortal Romance slots is a must-try for players, with high RTP rate and big bonus rewards.